Holiday parties and celebrations call for a party dress that is festive, fashionable, and fitted to your individual style. Simply Dresses has a collection of short semi-formal dresses in holiday colors, just right for celebrating throughout the season. Looking for a dress to wear for Christmas or New Year’s Eve? There are Christmas party dresses in red and green, as well as glittering New Year’s Eve dresses. From stunning little black dresses to gold sequined cocktail dresses, there are holiday party dresses for every kind of seasonal festivity. Want a white semi-formal dress with charming lace trim for a family holiday party? Embrace the vintage look of a party dress with lace detailing when you are home for the holidays, or go with a floral-lace short dress for a classy and collected look for a holiday work party. There are holiday party dresses in shades of red, green, purple, or blue, and beautiful metallic party dresses in silver or gold. Are you going to a holiday party that calls for a long formal dress? Check out the selection of long formal dresses here. Looking and feeling wonderful for every holiday, big and small, is easier than ever with fashion-forward party dresses from this collection of seasonal styles. How Should I Dress for Holiday Parties? - How fancy is the event and location for the holiday party? - Who else is attending the seasonal party? If your holiday party is fancy, such as a New Year’s Eve event, a short sequin New Year’s Eve dress is a glamorous choice. If you are shopping for a fancy office Christmas party dress, try a velvet Christmas dress in a festive red or green. Is the occasion more of a laid-back celebration? Simple lace Christmas dresses or jersey New Year’s Eve party dresses lend themselves well to more relaxed holiday festivities. Depending upon the formality of the event, you’ll want to pick a holiday dress to match. Typically, it’s best to choose a more embellished holiday party dress for fancy celebrations, but go with a more subtle, simple, classic party dress for small festive gatherings with friends. Once you have figured out how fancy the event is expected to be, it’s important to consider who else will be attending your holiday party. Will you be attending with friends, family, or co-workers? Modesty is an important element to consider when picking Christmas party dresses for office holiday celebrations. You will want to balance dressing festively with choosing styles that are appropriate for spending time with your coworkers. 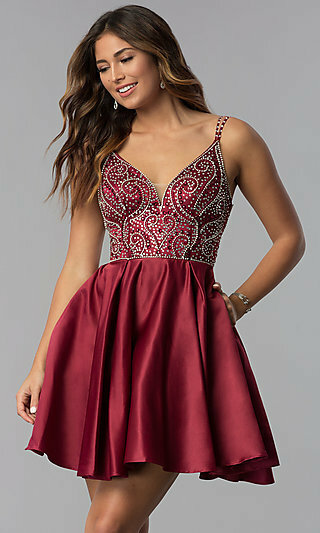 Cocktail dresses with knee-length skirts are a great option, or semi-formal dresses with sleeves can provide the perfect combination of seasonal sass with work-friendly style. Attending holiday parties with family sometimes calls for a modest look as well, but you know your family better than anyone! If they are more reserved, try a Christmas dress with a tea-length hemline or high-low skirt because it offers the ideal blend of a short and long dress. 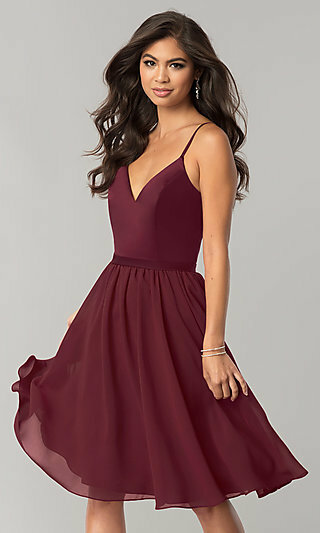 If you are attending a holiday party with less-reserved family or friends, explore v-neck cocktail dresses, New Year’s Eve dresses with sequins, or sleek little black dresses. Whether you are celebrating with family, friends, or coworkers, be comfortable and stylish in your holiday dress. Discover the possibilities in this array of holiday party dresses that are sure to fit your style and event.